"Pity? You don't want to be pitied because you're a cripple in a wheelchair? Stay in your house!" "People with disabilities are proud citizens, not objects of pity! We will not stay in our houses. We will protest the Jerry Lewis Telethon this Labor Day!" To people with disabilities who want the right to LIVE INDEPENDENTLY and SPEAK FREELY, those are fighting words! Jerry Lewis thinks that pity is the ONLY appropriate response to disability, and that people with disabilities who don't want pity should stay hidden away. This Labor Day weekend, we will NOT stay in our houses! 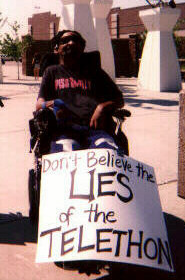 Instead we'll be out on the streets, challenging the Telethon's false portrayal of people with disabilities. Click on one or all of the links below to get involved in the movement AGAINST pity and bigotry, and FOR equality and dignity for people with disabilities.